Menopause is when a woman has not had a menstrual period for 1 year. It is called early menopause when it happens before age 40. 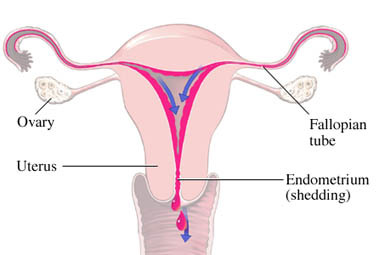 Periods happen when estrogen and progresterone hormones lower. The ovaries release these hormones. Menopause is a normal part of aging. The ovaries stop releasing eggs when hormones are too low. Surgery to remove the uterus or ovaries can also cause menopause. This is a normal part of aging. It is most common in women who are 40-58 years of age. You may not have symptoms. Your doctor will ask you about your periods. Menopause is when a woman has not had a period for 1 year. It is assumed due to age and symptoms. Sometimes, a blood test to look for follicle-stimulating hormone (FSH) may be done to confirm the diagnosis. High levels of FSH suggest menopause. Menopause is a normal part of life. It doesn't need treatment. HRT can be taken as tablets, gels, skin patches, vaginal rings or tablets, injections, and pellets placed in the skin. HRT can raise the risk problems like cancer, heart disease, and blood clots. Talk to your doctor about whether the benefits are greater than the risks. You should also have calcium and vitamin D for healthy bones. Milk and yogurt are high in calcium. Fish is high in vitamin D. Ask your doctor if supplements are needed. Sunlight also raises vitamin D in the body. Try not to eat spicy or hot foods or drinks. They can make hot flashes worse. Exercise may lower symptoms, manage weight, and lower stress. Weight-bearing exercises like walking and strength exercises may also help keep bones healthy. A mix of both works best. Menopause is natural. You can’t prevent it. Menopause. EBSCO DynaMed Plus website. Available at: http://www.dynamed.com/topics/dmp~AN~T114698/Menopause . Updated March 15, 2018. Accessed April 17, 2018. Menopause. Planned Parenthood website. Available at: https://www.plannedparenthood.org/learn/health-and-wellness/menopause. Accessed April 18, 2013. Menopause 101: A primer for the perimenopausal. North American Menopause Society website. Available at: http://www.menopause.org/for-women/menopauseflashes/menopause-symptoms-and-treatments/menopause-101-a-primer-for-the-perimenopausal. Accessed April 18, 2013. Moilanen JM, Mikkola TS, Raitanen JA, et al. Effect of aerobic training on menopausal symptoms: A randomized controlled trial. Menopause. 2012;19(6):691-696. 9/30/2008 DynaMed Plus Systematic Literature Surveillance. Available at: http://www.dynamed.com/topics/dmp~AN~T114698/Menopause : Jacobson BC, Moy B, Colditz GA, Fuchs CS. Postmenopausal hormone use and symptoms of gastroesophageal reflux. Arch Intern Med. 2008;168(16):1798-1804. 1/30/2009 DynaMed Plus Systematic Literature Surveillance. Available at: https://www.dynamed.com/topics/dmp~AN~T128400/Black-cohosh-for-menopausal-symptoms : Borrelli F, Ernst E. Black cohosh (Cimicifuga racemosa): A systematic review of adverse events. Am J Obstet Gynecol. 2008;199(5):455-466. 1/30/2009 DynaMed Plus Systematic Literature Surveillance. Available at: http://www.dynamed.com/topics/dmp~AN~T114698/Menopause : Kaszkin-Bettag M, Ventskovskiy BM, Solskyy S, et al. Confirmation of the efficacy of ERr 731 in perimenopausal women with menopausal symptoms. Altern Ther Health Med. 2009;15(1):24-34. 4/14/2009 DynaMed Plus Systematic Literature Surveillance https://www.dynamed.com/topics/dmp~AN~T900202/Desvenlafaxine : Archer DF, Dupont CM, Constantine GD, et al. Desvenlafaxine for the treatment of vasomotor symptoms associated with menopause: a double-blind, randomized, placebo-controlled trial of efficacy and safety. Am J Obstet Gynecol. 2009;200(3):238.